The founder and CEO of Huawei denies his company spies for China. 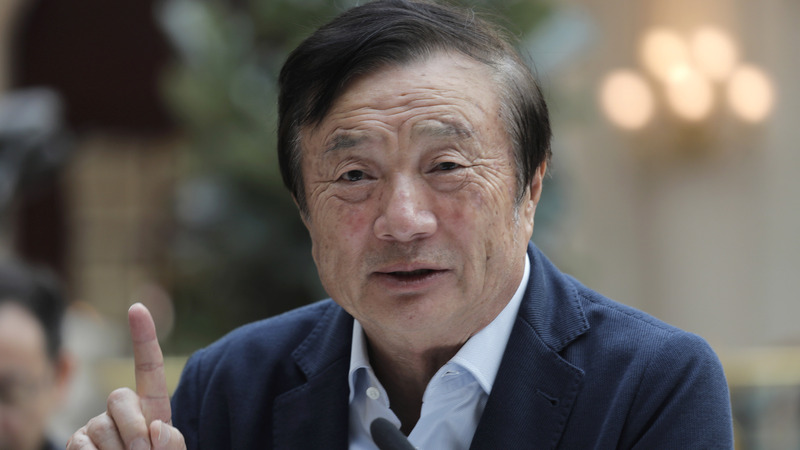 In a rare public appearance at the tech company's campus in Shenzhen, Ren Zhengfei told reporters he would refuse to share user data with the government if asked, and he said he misses his daughter, who is in Canada facing possible extradition to the U.S.
"No law requires any company in China to install mandatory backdoors," Ren said Tuesday, according to The Wall Street Journal. "I personally would never harm the interest of my customers and me and my company would not answer to such requests." Ren has not spoken publicly for years, The Journal notes. His comments to foreign media bear extra weight at a time where China appears to be playing a game of brinkmanship with the U.S., Canada and other trading partners. It's a fight that has threatened the life of a Canadian citizen and may cloud Huawei's ability to expand in western nations. Huawei is China's largest telecom equipment maker. Its sales recently surpassed Apple. But the U.S. has warned that Huawei has possible ties to Chinese intelligence and has urged allies not to use Huawei equipment as they build sophisticated 5G communications networks, NPR reports. Claims against Huawei date back at least seven years, NPR's Bill Chappell writes, when the House Intelligence Committee published a report that criticized Huawei over its ties to the Chinese government and possibly the military. Ren pushed back on those suspicions Tuesday and asserted that his company is independent, owned by its employees. He implied that this arrangement buffers his company from outside influence. "There is no external institution that owns our shares—even 1 cent," Ren said, according to The Wall Street Journal. Donald Clarke, a specialist on Chinese law at George Washington University, tells NPR he doubts Ren's assertions that his company would refuse to hand over user information to the government. "In practice it seems to me profoundly unrealistic to suppose a Chinese company could say no when Chinese national security officers come knocking and say, 'Give us this information,' " Clarke says. "China is not a liberal democratic society with independent sources of power and a philosophy of limited government. Citizens do not have that kind of power to resist the government." American companies including Apple have resisted U.S. government efforts to recover private data from their devices. Ren spoke a day after a Chinese court sentenced a Canadian man to death for drug smuggling. Robert Lloyd Schellenberg, 36, was found guilty of trying to smuggle methamphetamine from China to Australia, NPR's Sasha Ingber reports. Schellenberg's death sentence is the result of a sudden retrial. Chinese authorities in 2014 had arrested Schellenberg on suspicion of smuggling half a ton of methamphetamine. He was sentenced to 15 years behind bars in November, CBC reports. After Schellenberg appealed, he was retried and sentenced to death. Drug dealing can be a capital offense in China, but Canadian Prime Minister Justin Trudeau has condemned the new sentence and pledged to intercede on Schellenberg's behalf. "It is of extreme concern to us as a government as it should be to all our international friends and allies, that China has chosen to begin to arbitrarily apply the death penalty ... as in this case facing a Canadian," Trudeau says. Huawei has come under increased scrutiny since Canadian authorities arrested Ren's daughter and Huawei CFO Meng Wanzhou on Dec. 1. Prosecutors say she lied about the company's business with Iran. The U.S. seeks her extradition. Clarke says he believes Schellenberg's sentence is connected to the Meng case in what he termed, "death threat diplomacy." In addition to Schellenberg, two other Canadians are currently detained in China: Michael Kovrig and Michael Spavor, reports NPR's Matthew Schwartz. Schellenberg's death sentence comes just after Poland arrested a Huawei executive on Jan. 8 on charges of spying for China. NPR's Bill Chappell reports the tech giant's sales director in Poland, along with a Polish citizen, were detained by authorities. The Wall Street Journal reports that Poland has charged its citizen, Piotr Durbajlo, with spying for China while he worked in government. Huawei fired its employee, Wang Weijing, over the weekend and claims his actions are not connected to the company. Huawei has also been named in several recent high-profile cases involving privacy and data. Facebook admitted in December it had granted the Chinese firm special access to the social network's users, The Washington Post reports. Thorsten Benner is co-founder of the Global Public Policy Institute in Berlin and author of a recent Foreign Policy column titled, "Germany Is Soft on Chinese Spying." He says Huawei faces a delicate balance. "Until now they've been in the sweet spot," Benner tells NPR. "They've been able to take advantage of the benefits of being headquartered in a one-party system with a huge customer base. They got incredible economies of scale. They got 75 percent of the domestic market ... while not being confronted with the critical question of whether Western countries can trust Huawei."